On Sunday, November 9, members of the HSVD Community Service Club completed a 5K walk to raise awareness for Kidney Disease. The weather cooperated and we enjoyed a beautiful autumn walk from Foley Square over the Brooklyn Bridge and back. We raised money for the cause and helped to raise awareness of this disease. We walked in honor of Manuel Santos, uncle of walker and senior club member Indira Hernandez who recently received a kidney transplant and is recovering well. 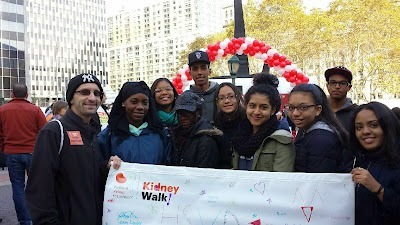 Walkers included seniors Carolina Gonzalez (club president), Anisha Cartagena, Melisse Valdez, Ayannah Salaam, Indira Hernandez, Brian Ferreira, and Ariel Smith, juniors Gabby Ogando, Dimitri Adams, and Karina Alvarez, sophomore Jacinth Richardson, and Mr. Rau (club advisor). In addition, we were joined by Jacinth’s Dad and Ariel’s sister. Well done HSVD! HSVD Polo Shirts on SALE! Check out these pictures in the Gallery Section!